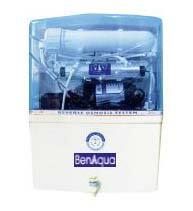 Contact us for immaculate-quality Ro Water Purifier Systems with Reverse Osmosis Filter! We procure these Ro Water Purifier Systems with Reverse Osmosis Filter from the vendors who comply with industry stated norms. Strict quality tests based on different parameters ensure that only defect-free Ro Water Purifier Systems with Reverse Osmosis Filter reach the buyers. Available at the nominal rates, these Ro Water Purifier Systems with Reverse Osmosis Filter are proven effective in decontaminating water from the biological contaminants, undesirable chemicals & suspended solids. Also, we address to bulk queries. Physical processes : filtration, sedimentation and distillation. Biological processes : sand filters, active carbon filters. Chemical processes : coagulation and flocculation, chlorination. Electromagnetic radiation : ultraviolet light.